How are the penguins of the South Orkney Islands doing? A recent long-term study reports on the development of the three brush-tailed penguins: Adélie, Chinstrap and Gentoo penguins on the South Orkney Islands. The study compares their situation with the population development around the Antarctic Peninsula. The scientists can look back on a continuous census data set of 38 years, since 1978/79. Previously only sporadic counts were done. While the populations of Adélie and Gentoo penguins were subject to regular fluctuations, the number of Chinstrap penguins decreased steadily. 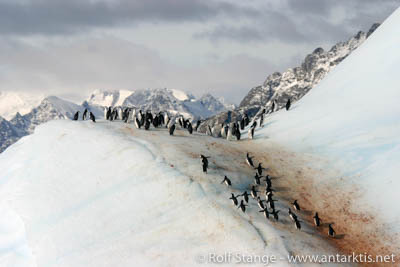 However, the Adélie penguin colonies were also decreasing. The Gentoo penguins did relatively well over the years, their numbers were increasing – a trend that is also observed at the Antarctic Peninsula. The researchers explain the observed fluctuations with a lively exchange of nesting birds between colonies of the archipelago. At present, Adélie, Chinstrap and Gentoo penguin populations at the South Orkneys are estimated to be about 200,000, 600,000, and 5000-10,000 breeding pairs, respectively. Today it is assumed that a change in population size can be a good indicator of changes in the ecosystem. This is researched in a number of krill-eating species, e. g. also the brush-tailed penguins. The Commission for the conservation of Antarctic marine living resources (CCAMLR) uses this data to monitor the marine Ecosystem. With that they can set catch limits for the krill and fish fisheries. All three species are breeding together on Signy Island, South Orkney Islands. While the breeding success of all species is equally good or bad over the years in the observed period, the population development is different. Since the beginning of the continuous census Adélie penguins decreased by 42% and Chinstrap penguins by 68%. In the same period, the originally much smaller Gentoo penguin population increased by 255%! Historical data show a completely different trend between 1947 and 1978: the numbers of the first two species increased enormously during this early period. According to some scientists, the population development seems to be correlated to the regional decline in sea ice extent and the long-term warming of the region. However, the researchers of the present study are looking a bit deeper into the context, because ice-loving Adélie penguins and ice-avoiding chinstrap penguins are subject to the same decline. They point out that the survival rate of the young penguins during their first winter, the access to krill stocks and the increase in fur seal numbers and whales as food competitors in the area, also seem to play a major role. Between 1977 and 1994, the number of fur seals increased tenfold at Signy Island. In order to gain a better understanding for the decline of one species and the success of another, researchers have to look into the dynamics of the system even deeper. Their long-term data of the last decades and data from other field of subjects are important components for future models and understanding of the processes observed. Chinstrap penguins near the South Orkney Islands. Many antarctic visitors have enjoyed the hospitality of the Ukrainian Vernadsky Base. Now you can visit Vernadsky without actually traveling to Antarctica: there is now a new, complete panorama tour of the base on this website, from selected scientific working areas to the famous Faraday Bar. Click here and have fun! 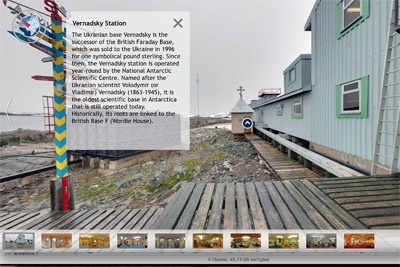 Click here to enter the new virtual tour through Vernadsky Base. North-West of the Antarctic Peninsula the South Shetland Islands are situated. Here research stations of many countries are gathering, because some of the islands are easy to reach by ship and there are relatively large ice free areas. During the last decades the climate has become noticeable warmer inWest-Antarctica, particularly at the Peninsula. Some people are comparing the summer weather of the South Shetland Islands already with the summer weather at the Falkland Islands. The largest island of the South Shetlands is King George Island. It is approximately situated 1000 km South of Cape Horn. One-tenth of the island is free of ice and offers sufficient space for 24 research stations and refuges of 12 nations. 8 stations are operated all year long. German researchers are regularly in the area during summer time. On King George Island, many biologists tend to work. They observe the scarce plant life. Others analyse terrestrial-maritime food chain connections or study marine habitats. Ornithologists usually work with penguins or skuas. But all scientists usually also have an eye for unusual occurrences. Polish researchers have been studying birdlife at the South Shetland Islands for almost 40 years, since their station opened for the first time in 1977. In 1981, White-rumped sandpipers (Calidris fuscicollis) were observed for the first time on Ardley Island, a small tidal island in Maxwell Bay. However, this does not mean that this species has not visited the area before. The observation program only got started in 1977. Since then small groups or single birds have appeared in the region. 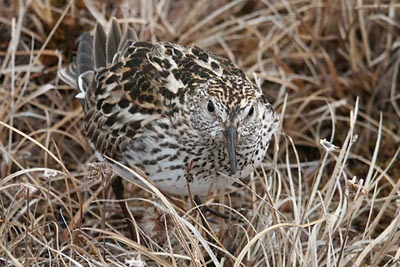 Over an period of 30 years, these small waders were observed during twelve years. In eight of these cases spring was warmer than usual. White-rumped sandpipers are migratory birds of superlatives, like the Arctic tern. They breed in the Arctic tundra of North America. Within a month, the birds migrate in big flocks to the South, almost without rest. Reaching the coast of Suriname, they then turn in to the continental route and cross the Brazilian Amazon region. In October they arrive in their wintering areas in Argentina and Chile. The most restless individuals continue further and spend the winter in Tierra del Fuego or the Falkland Islands. Why some individuals would head for islands in the cold Antarctic waters, such as South Georgia, South Orkney, or South Shetlands, the researchers begin to understand slowly. In contrast to other regions of the Antarctic continent, the Antarctic Peninsula experiences a rapid, dramatic warming. Measurements of average summer temperatures resulted in an increase of 2 degrees, the average temperatures for the winter are yet 5-6 degrees higher than 50 years ago. Lower winter temperatures and the existing hole in the ozone layer are responsible for less frequent but stronger periodical westerlycyclone systems. They transfer warm, moist, maritime air to the coast of the Peninsula including a number of feathered vagrants. In addition, the season with sea-ice cover is about 90 daysshorter than 4 decades ago. At the Antarctic Peninsula, the sea ice arrives later and disappears earlier. All this are preconditions for faunal and floral change over the coming decades. This is especially the case for the most northerly spur of the Antarctic: the South Shetland Islands. White-rumped sandpiper (Calidris fuscicollis). Photo © Wikimedia Commons.